We live in an age of concern about the wholesomeness of our food, about the widespread use of pesticides and artificial fertilisers, about food miles, the use of preservatives, artificial additives and colourants. We are aware of the industrialisation of food production and processing, the erosion of seasonality as food is now available to us at any time from any corner of the world and, more and more, of the ever-widening gap which has developed between production and consumption – how few of us produce what we eat or produce sufficient to feed ourselves. Those who produce even the smallest amount of what they consume, a token nod to self-sufficiency, will, at least, realise that the gap in quality and taste between what they have from their own gardens and what they purchase at the local supermarket is quite enormous. No supermarket tomato will ever taste as sweet, as genuinely ripe as one raised in your own glasshouse – it stands to reason: the supermarket tomato has to be picked before it is ripe so as to ensure a reasonable shelf-life while those home-grown are picked at the peak of ripeness and perfection and have only to travel from your garden to your kitchen table. No supermarket egg will taste as good as those from your own hens and the limp, callous-ended rhubarb and asparagus I saw on the shelves of my local supermarket this morning cannot compare with that picked and used immediately from my own garden. These genuinely concerns have led to the phenomenal growth of Grow Your Own and Grow It Yourself gardening groups and parallel businesses providing “healthy” or “organic” food and publications assuring the nervous that they can make a difference; that the raised bed in the back garden will save the world, guarantee the health of their children, save us from climate change and ensure the future of the planet. I write this with my tongue firmly pushed into my cheek and certainly do not dismiss nor wish to belittle the efforts of home growers but I feel they vulnerable and are often targeted by people who are there for their own personal benefit rather than for any altruistic motives or any genuine belief in what these people are doing – as a friend once described a common acquaintance, “He came to do good; and he did well.” People have made a career out of targeting the worries of others. We grow a limited selection of vegetables and fruit in our own garden; certainly not remotely near enough to consider ourselves in any way self-sufficient but it gives us great pleasure to have even a small selection of high-quality food produced at home. 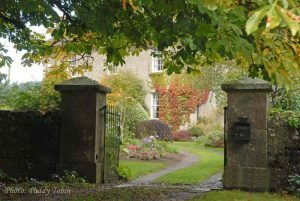 There will be many more like us who do the same and enjoy it very much and enjoy learning more about how best to manage a vegetable patch by attending talks by experienced growers or to reading books on the subject. The author in the garden and, above, with a food grower. 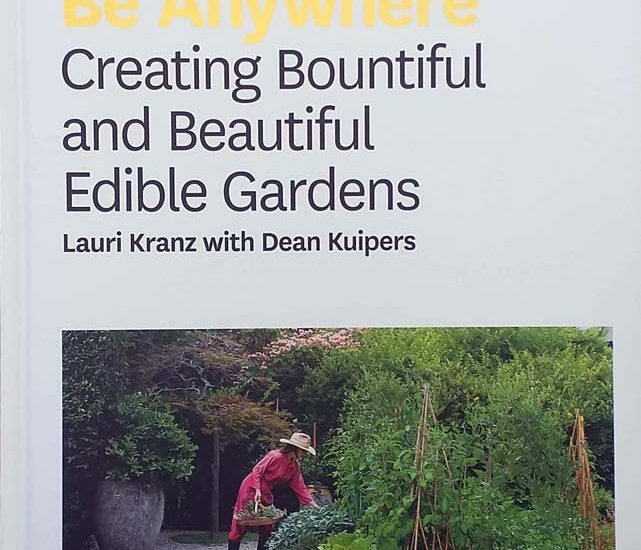 “A Garden can be Anywhere” was written by Lauri Kranz, the founder of Edible Gardens LA. Her well-known clientele includes chefs, celebrities, rock stars and more while her daily posts on Instagram reach 7,000+ and her Tumbler has 20,000+ followers! She expounds her philosophy that nourishment and beauty are what most people desire, that people need to be in contact with the earth and with their food and wish to involve their children in the process and that planting in the garden is best when it imitates nature, is part of nature and not separate from it. There is advice on good garden design, developing and maintaining the soil, compost and plant rotation and, invariably, the vegetable patches end up in raised beds – red cedar makes the most beautiful raised beds! The author’s company develops vegetable gardens for her clients and the book features many “case studies” discussing site, preparation, building and development of the vegetable garden. It would not be unfair to say that these are lifestyle rather than productive gardens and the style of photography in the book bears that out – moody and atmospheric: the languid lettuce, the fetching cabbages, the crispy kale and the glass of wine in hand all under the Californian sun. It reminds me of that old British television sitcom, “Never Mind the Quality; Feel the Width”. It is a pleasant and enjoyable read, attractively illustrated but it won’t tell you how to grow your spuds!